Port Rowan Mennonite Brethren Church, 1949. Russian Mennonite immigrants came to the Selkirk, Ontario area in 1925 to be hosted by the Pennsylvania German Mennonites who had been there since the late 18th century. In 1926 these immigrants took up land in the Port Rowan area. These Mennonite families were from the Mennonite Brethren and General Conference Mennonite backgrounds but they were worshiped together in the Messiah Church building. In 1927 the Mennonite Brethren families formed their own congregation with 11 charter members. This group met in private homes periodically to discuss their own business but they continued to worship together with all the Mennonite families in the Messiah Church building. In 1940 the two groups separated and the Mennonite Brethren families purchased the Messiah Church building. The Messiah Church building was expanded in 1946 when more space was needed when more families moved into the area. Renovations were completed in 1949. The language transition from German to English began in the 1950s. In 1958 a new meeting house was constructed. The original Messiah Church building, built in 1883 was finally dismantled in 1977 after having been moved one last time. 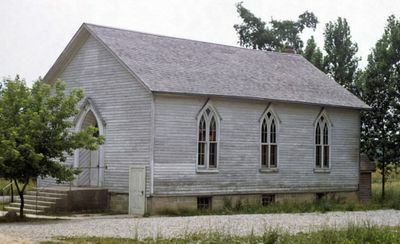 In 1970 an education wing was added to the 1958-built meeting house. In 1976 a foyer was added. Port Rowan is the parent congregation to Simcoe Mennonite Brethren and Evergreen Heights Christian Fellowship. Mennonite Brethren Herald (7 February 1986): 18; (27 May 1988): 53. Teigrob, David. What Mean These Stones: Mennonite Brethren Church, Port Rowan, 1927-1977. Port Rowan: Port Rowan Mennonite Brethren Church, 1979, 90 pp. When Your Children Shall Ask: a History of the Ontario Conference of Mennonite Brethren Churches, 1957-1982. 1982: 41-43. Church records at Center for MB Studies, Fresno, California, copies at Centre for Mennonite Brethren Studies, Winnipeg, Manitoba. Janzen, H. H. and Marlene Epp. "Port Rowan Mennonite Brethren Church (Port Rowan, Ontario, Canada)." Global Anabaptist Mennonite Encyclopedia Online. January 1989. Web. 19 Apr 2019. http://gameo.org/index.php?title=Port_Rowan_Mennonite_Brethren_Church_(Port_Rowan,_Ontario,_Canada)&oldid=147248. Janzen, H. H. and Marlene Epp. (January 1989). Port Rowan Mennonite Brethren Church (Port Rowan, Ontario, Canada). Global Anabaptist Mennonite Encyclopedia Online. Retrieved 19 April 2019, from http://gameo.org/index.php?title=Port_Rowan_Mennonite_Brethren_Church_(Port_Rowan,_Ontario,_Canada)&oldid=147248. Adapted by permission of Herald Press, Harrisonburg, Virginia, from Mennonite Encyclopedia, Vol. 4, p. 204. All rights reserved. This page was last modified on 21 February 2017, at 21:06.